From age five, Melanie Ariens had what she calls a “making things” problem. She drew pictures all the time, she checked out books from the local library to learn how to knit. As she grew up, she sewed her own formal dresses and made jewelry out of bike parts. After her kids went to school, Ariens set about to make her art her business, and opened up a mixed-media studio at RedLine-Milwaukee. She’s become known for her water-themed art, a focus of her combined loves of art and environmental activism. The Milwaukee Metropolitan Sewerage District recently hired Ariens to create new manhole covers, which feature birds and flowers. She uses mostly recycled materials to make art that makes people think about the Great Lakes, the rivers, and the water we drink. “How do you use art as a communication tool to capture people’s hearts?” she asks. Living three blocks from Lake Michigan has given Ariens a closeness to water issues. While water gives her joy, she also is disturbed by threats to the water, including invasive species and trash scattered on the beach. 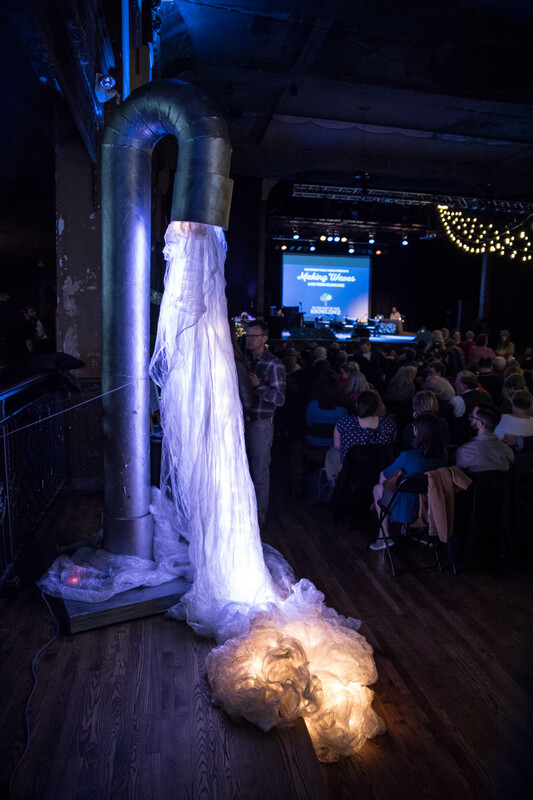 For the April 19 radio show Making Waves: Live in Milwaukee from To the Best of Our Knowledge, Ariens set the scene at the historic Turner Hall. 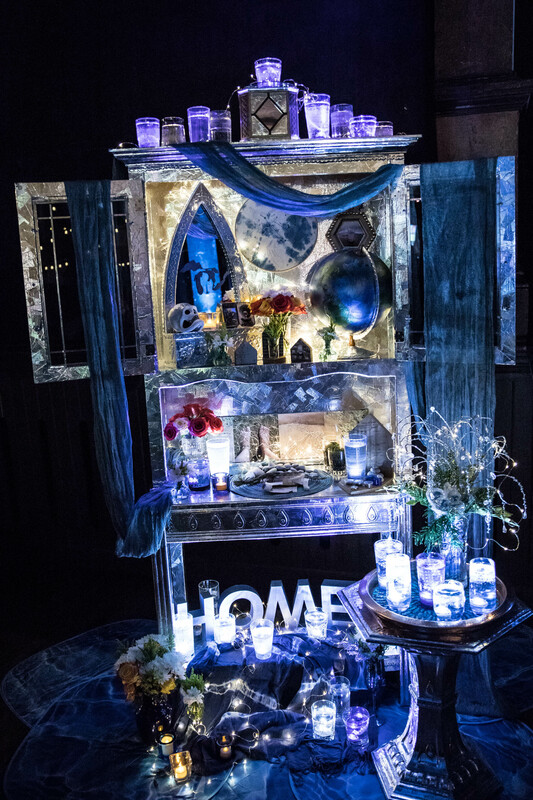 Her husband, mom, and dad all came out to help her set up three installations for the evening: a 9 ½ -foot water faucet, a water shrine with pictures, words, and glasses of water creating a spiritual corner of the venue, and a silver mobile of the Great Lakes, hung from the balcony. Raoul Deal, an artist and educator at University of Wisconsin-Milwaukee, says he likes to send art students to work with Ariens. “She’s an amazing mentor,” he says. “She will take people under her wing and go out of her way to help them.” Ariens also studied art and geology at UWM. Deal describes Ariens as versatile, in both the materials she uses for her work and how she relishes experimentation. But as varied as her art can be, it has a clear goal. “Her art is set up to bring people together,” says Deal. In 2013, the Milwaukee Water Commons, a network of people working on water issues in the city, named Ariens their Artist in Residence. Ann Brummitt, co-executive director of the Milwaukee Water Commons, says they like what Ariens does so much that they keep renewing her, and the residency continues today. Brummit remembers a time when she wanted to reach people—regular residents, not politicians or experts--in Milwaukee to get their ideas about what’s important to them about water. Ariens not only came up with the idea of doing mobile outreach on “water cycles,” but built two bicycles out of rain barrels on bikes. Brummit and Ariens each pedaled around the Milwaukee to different events. Brummit said the novelty of the water cycle drew people over, and then they could ask their question- how does Milwaukee become a water city? The top answers, she says, were good jobs, water quality, good drinking water, water in arts and culture, education and water recreation, and connection with kids. The Water Commons built much of their strategic plan around those answers and conversations. “She’s a total connector,” says Brummit, about her ideas of how to reach people. The next summer, Ariens built a watershed wagon, a moveable watershed that can be biked to events to teach about the water environment. Ariens’ next project is her most ambitious yet—a large-scale cloth rendition of the Great Lakes (she’s thinking basketball-court sized) that she will take on tour to schools and other places for kids to experience. She was inspired by the Native American Water Walkers, who hike around bodies of water to pay respects to the water and raise awareness of water issues. Ariens would like to guide a new generation to walk around this traveling water exhibit. “I want people to feel like they are making a journey, that’s it’s an educational, powerful, spiritual journey,” she says. What’s motivating Ariens most right now, she says, is encouraging younger people to think of themselves as water stewards. “I’m driven by the idea of what I’m handing off to my children,” she says.